On Reddit or other forums, you’ll often come across spoiler tags which may look a bit like this. They’re used to discuss spoilers while protecting other readers who do not wish to be spoiled by requiring them to actively interact with the spoiler tag to view its contents. Although it doesn’t look like it, the message above is at least 4000 characters long. Between the spoiler warning and the actual text are 4000 zero-width spaces: U+200B ZERO WIDTH SPACE in Unicode or &#8203; in HTML, enough to cause the displayed message to be truncated. My friend Ji An and I got the idea when we were discussing our solutions to last year’s Advent of Code—we were doing so in a WhatsApp group for our shared leaderboard, but we didn’t want to spoil the experience for those of us who had yet to solve the problem being discussed. Hide content behind a "Read more" button in a WhatsApp message. 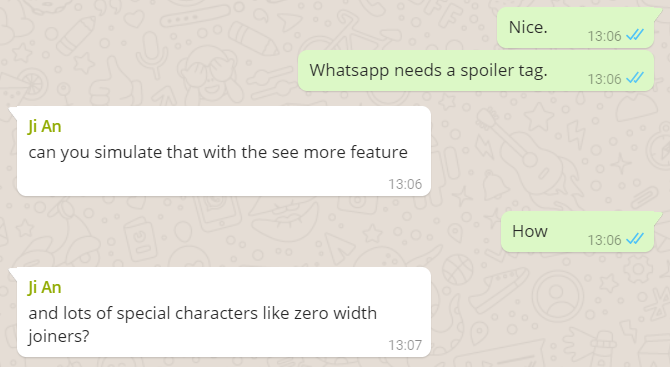 After setting a spoiler warning to be shown before the spoiler (warning) and the actual content of the spoiler (content), we add 4000 zero-width spaces (for safety—around 3100 seems to be enough on WhatsApp Web, but more are needed on mobile) between the two and display the result for the user to copy. There are some side effects with this hack though. Firstly, adding 4000 zero-width spaces makes the message length more than 4000 characters long. In fact, because a zero-width space is encoded under UTF-8 as 3 bytes (E2 80 8B), a message with a spoiler tag may actually be larger than 12 kB in size! It actually causes some unexpected behavior in WhatsApp, such as truncated message histories or just a general slowdown. Although this was something we did at the end of last year, since Avengers: Infinity War was just released in cinemas recently and it’s relatively plot-heavy for a Marvel film, I thought it was a good time to write about this.